❉ All measurements are taken in inches. Please ensure fit before purchasing. All sales are final. No returns or exchanges. Condition: Great! Cleaned and ready to wear. Follow us on Instagram, @dethrosevintage, to receive early previews, and special sales! Dethrose Vintage is not responsible for ANY custom fees. We can not adjust the pricing to reflect a lower amount on the customs form, this action is fraudulent and can result in Etsy taking action against the shop. I’m a return customer for a reason. Love my new coat. Great quality and perfect for spring! Dress arrived smaller then measurements provided, with darker yellow areas around neck and shoulders (not described), one dart taken out and the other one not, and some large holes in lace. I wrote a couple of times to the shop, I however never got any replies which made me sad as I have been a frequent customer for many years. Credit Cards are the only forms of payment accepted. Coupon codes can not be used in combination with any other discounts. No reserves or layaway terms are held during sale time. NO refunds, Cancelations or exchanges are offered. All items are described accurately and all detail is given. If you have questions please contact me before purchasing. All accurate measurements are given. 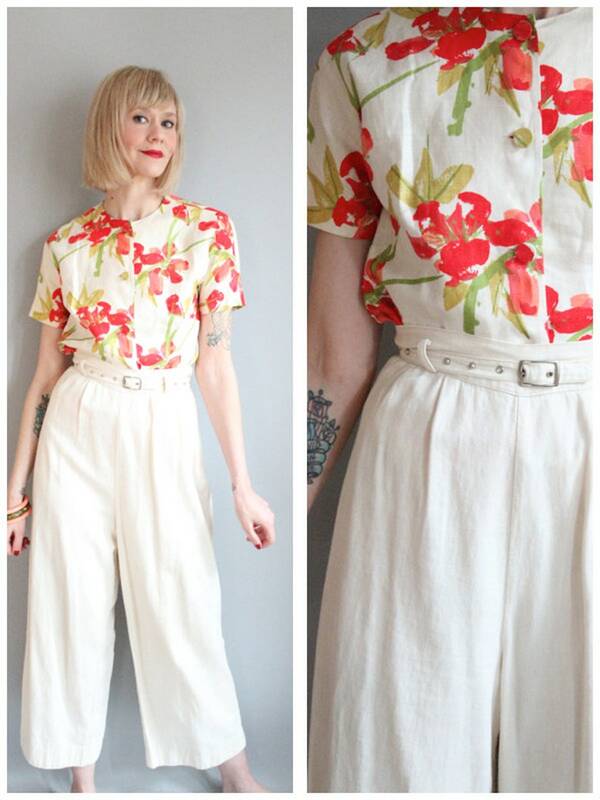 If you are unsure how to measure yourself to fit vintage, please let me know and I will help as much as possible. Keep in mind, Vintage fits far different than modern dress sizes. That is why it is best to go by the measurements provided to get the most accurate fit. All flaws or wear are noted in the description. Items are vintage so there is normal wear. Minor flaws may go unnoticed but I disclose everything that I am aware of. Sales are Final. I ship Domestic 2-4 business days after payment is received. I ship Priority mail with delivery confirmation on Tuesday-Friday. Packages ship 3-5 business days after purchase. Please allow 3-8 weeks for delivery. Dethrose Vintage is NOT responsible for lost packages. Dethrose Vintage is not responsible for lost packages, all shipments Domestic have a tracking number and shipped Priority unless alternative shipping is requested. International is shipped First Class unless alternative shipping is requested. Please convo for further questions. Delivery Confirmation is always included with Domestic, if you would like the tracking number just ask. Dethrose Vintage Reserves are available for 24 hours. A longer reserve is available upon request with a 25% non-refundable deposit. Layaway is available for items over $150. 4 payments of 25% over a 4 week period, the first payment is nonrefundable, just in case a buyer changes their mind. Payments must be paid immediately once the invoice has been sent. If not paid within 24hrs, the layaway will be cancelled and the deposit is forfeited. The first three payments are issued through invoices on PayPal and the fourth payment is finalized here at checkout with shipping on Etsy. Please email for further questions. Thanks! **Photos featured are property of Dethrose Vintage. Please do not copy, reuse, or post without permission. If used improperly, you will be in violation. 2.Service providers. I engage certain trusted third parties to perform functions and provide services to my shop, such as delivery companies. I will share your personal information with these third parties, but only to the extent necessary to perform these services. 3. Compliance with laws. I may collect, use, retain, and share your information if I have a good faith belief that it is reasonably necessary to: (a) respond to legal process or to government requests; (b) enforce my agreements, terms and policies; (c) prevent, investigate, and address fraud and other illegal activity, security, or technical issues; or (d) protect the rights, property, and safety of my customers, or others. 1. Access. You may have the right to access and receive a copy of the personal information I hold about you by contacting me using the contact information below. 2. Change, restrict, delete. You may also have rights to change, restrict my use of, or delete your personal information. Absent exceptional circumstances (like where I am required to store data for legal reasons) I will generally delete your personal information upon request. 3. Object. You can object to (i) my processing of some of your information based on my legitimate interests and (ii) receiving marketing messages from me after providing your express consent to receive them. In such cases, I will delete your personal information unless I have compelling and legitimate grounds to continue using that information or if it is needed for legal reasons. 4.Complain. If you reside in the EU and wish to raise a concern about my use of your information (and without prejudice to any other rights you may have), you have the right to do so with your local data protection authority.